The first thing we can all do is keep our minds and hearts open and work hard to maintain a positive attitude toward each other. We need to remember that we're a community filled with caring people that sticks together - we don't let things divide us. Lack of knowledge, misunderstanding, and misguided emotions are our enemies, not our neighbors. As we work this out, let's do everything we can to stay connected and make a common decision that we all can live with. Please use the Links at the left to learn about the topic of alternative energy and wind turbines. Becoming accurately informed is key to making sound community decisions. Subscribe to get our regular Updates in your Inbox or bookmark "Updates" and check back from time to time to keep up with the ongoing wind power controversy locally. 1) Let us know what you think about our website by emailing any suggestions, corrections, encouragement, or criticism you may have. You may also respond to anything we've posted in our new "Updates" section or write us a note for posting if you'd like (larger letters can be posted as attachments). 2) Talk with your neighbors. Make sure they understand what's really going on. 3) Write a Letter to the Editor (see Media Contacts at left) or submit a paid editorial article to The Valley News (click here or visit our "Updates" section to read some of our articles). Our thanks also to all of you who've been coming out for Informational Meetings, the Town and Planning Board's public hearings and regular monthly meetings, and/or the weekly meetings of Reform Cohocton. Your input and participation have been appreciated. Keep coming and invite your friends and neighbors! Please check our Community Calendar for dates and times. We've started a collection of beautiful pictures of Cohocton's uncluttered hills and sky for posting with Picasa, on Flickr (see our "Updates" section), and in an online PowerPoint show. We're also interested in brief stories about how and why you chose to live in Cohocton. If you have any digital images or stories that you would like to share with us, please send them to me. Thanks! Click here to hear a blessing from Roma Downey. If, after studying the subject, you agree with our stand in opposition to the placement of wind turbines on our hills, then let people know you care with a bumper sticker or yard sign! or call Michelle at 384-5610.
and offer input to Town leaders (Click here to read our last Proposal with links to our previous submissions). 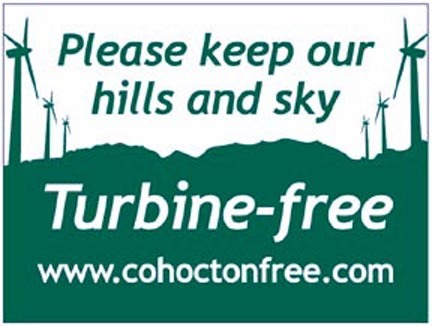 Prior to August 2007 our steadfast recommendation was to write to the Cohocton Town and Planning Boards at the addresses below with your comments, concerns, and questions about the proposed wind projects. Unfortunately, this approach proved to be fruitless. By early Summer 2007 it became very clear that our good faith efforts to gain the ear of the developer, its pledged leaseholders, and our Town's elected and appointed officials had failed. With its acceptance of the developer's seriously flawed Final Environmental Impact Statement (FEIS), our appointed Planning Board continued to fast-track the project by approving the associated site plans and giving UPC Wind the green light to begin construction in August 2007. Throughout 2006 and into 2007 it became abundantly evident that the Town's leadership was never genuinely interested in or even willing to receive any constructive input that would question or alter UPC Wind's plans in any substantive way. As a result we reluctantly came to the conclusion that new leadership was sorely needed in Cohocton and threw our full support behind the Reform Cohocton movement and its candidates for office in the 2007 elections. Unfortunately, the majority of Cohocton's voters did not agree with us and returned the incumbents to office. We can only rely on God's grace and pray for an unusual breakthrough that will allow men and women of good will to redeem a process that has gotten more and more out of hand with each passing month.